In an earlier post I wrote about Mario Vellutini who worked for John Patroni, also known as “Big Daddy”. Patroni owned the aptly named Patroni House, a prohibition roadhouse that once stood where the Half Moon Bay Brewery is located today in Princeton. Not only was the Patroni House centrally located– but Mr. Patroni was a key figure, as in “the man”. Patroni also took pride in the food he served and cleverly outwitted the competition. Thus John Patroni avoided the stinging penalty of too many raids. A raid could also mean that a roadhouse– or “resort” owner like Patroni had failed to honor the custom of the time by making certain the appropriate officials got their regular “salary”. “Patroni gave big meals at low prices,” Vellutini divulged, “and if people stayed for the weekend he gave them discounts.” Mario recalled seeing 500 people in Princeton at one times–a tremendous crowd. Those were the days when folks traveled to the Coastside to dine on the delicious local mussels. The Patroni House building was owned by John Patroni but it was located on real estate belonging to Coastside landowner Henry Cowell. Cowell, recalled Mario Vellutini, kept raising Patroni’s rent, ultimately igniting a feud. The “padrone” hit upon a plan to outwit Cowell and avoid the steep overhead by buying the adjacent property. One night, under cover of darkness, Patroni moved his entire building over to the the newly purchased land. Outraged, Cowell retaliated by building his own restaurant next door to Patroni’s. Note: Mario gave me this photo. 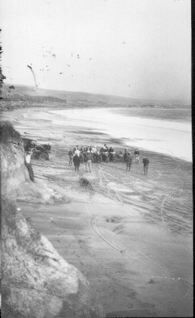 it’s of the beach between Miramar & El Granada and shows some men on motorbikes.